Also known as, the day Christmas crafting turned its back on me. I almost didn’t post this. 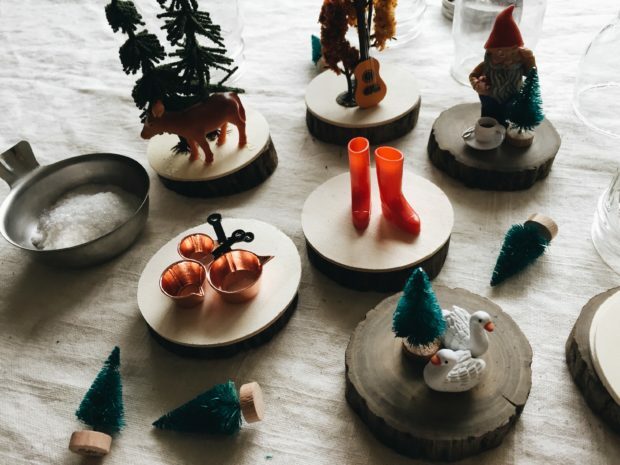 Because frankly, these DIY snow globes totally blow. But then I thought, “You know what, it’s my job to watch out for fellow crafters out there. Make sure they take no wrong turns in craft life! Lead them in the right silicone glue vs. hot glue direction! Guide them far far away from glitter land!” So here we are. Theee worst Christmas craft you’ll witness this season. Heck, this year. HECK, this lifetime. By the way, I’m starting a new support group. DIY – DON’T IT YOURSELF. You on board? If I cry multiple times during this post, just talk amongst yourselves. I had such great intentions for these snow globes! Visions of charming little wonderlands enveloped in a magical sparkly world. Like copper pots, rubber boots and coffee cups. Hahahaha! What, it’s cute. First, you’ll collect miniature thingies and doodads. This is the fun part! What goes inside of the globe that you’ll eventually detest and want to throw in a lake. 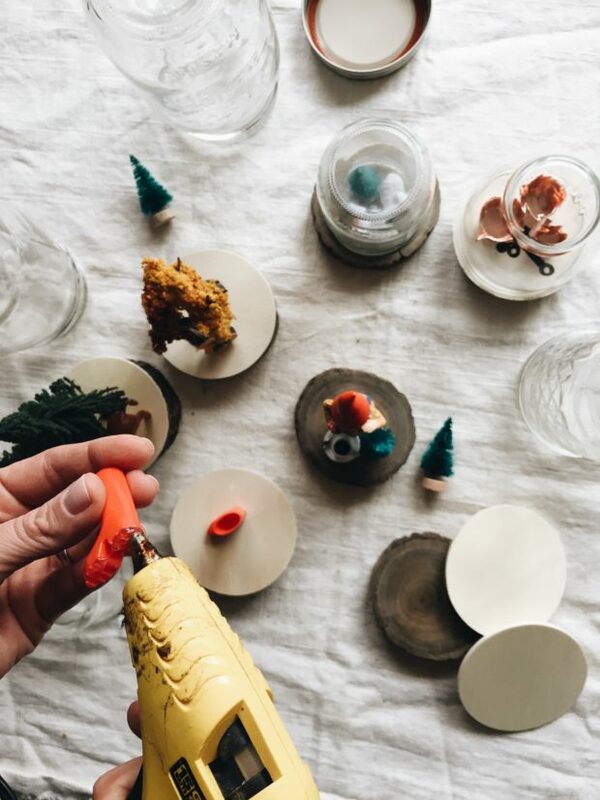 You can find bags of tiny farm animals and knick knacks at any craft store. 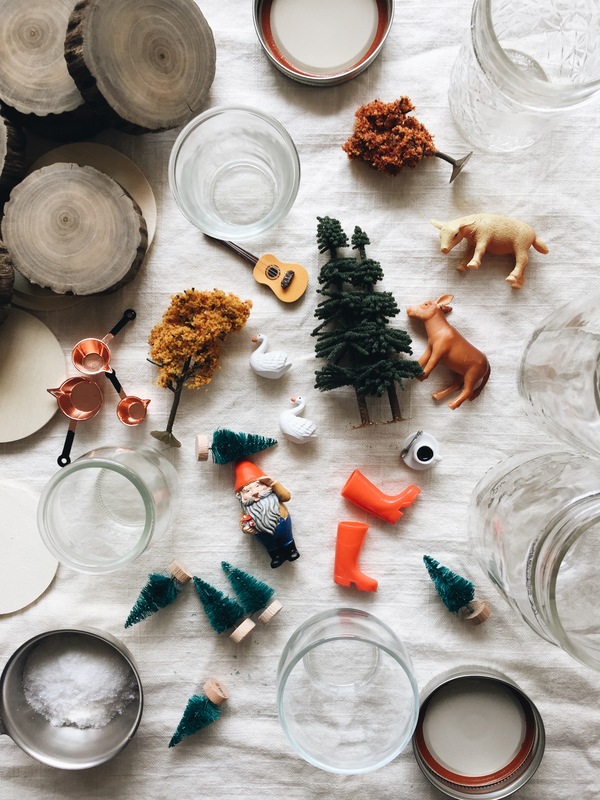 While you’re there, pick up a few mason jars, jam jars, votive candle holders, etc. Take a moment to love yourself right now. Because later on this will all change. I wanted my globes to have a homey slash rustic feel, so I hot glued some basic wooden circles to some other wooden coasters that Aaron made all the forevers ago. This was my base. Or so it was supposed to be. 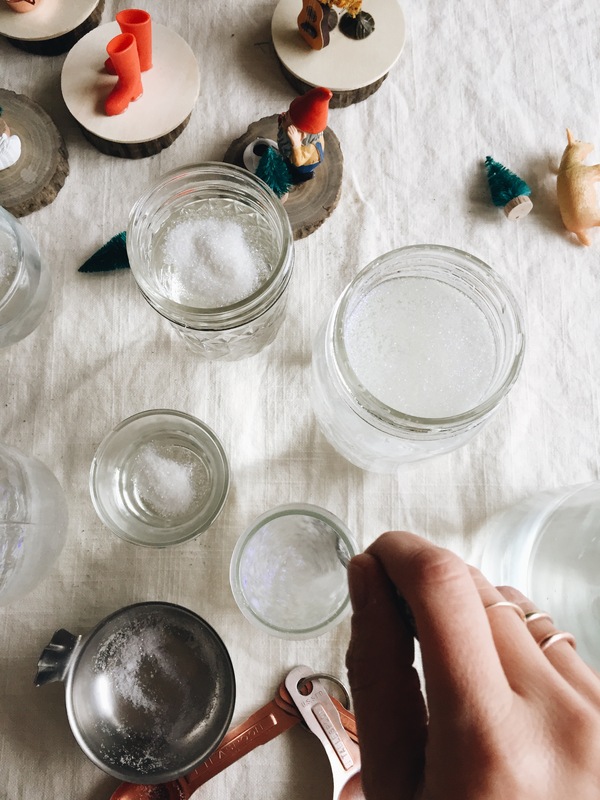 Other crafters used the lids of the mason jars, which was then glued to a base of their choice. I skipped the lid part. This might have been my first wrong turn. That and new shampoo, but I’m not going to put that on you. I then hot glued the various little thingies to the wooden bases. Things were going so well! I was happy. Gleeful. Chipper. Naive like a baby deer to the darkness ahead. 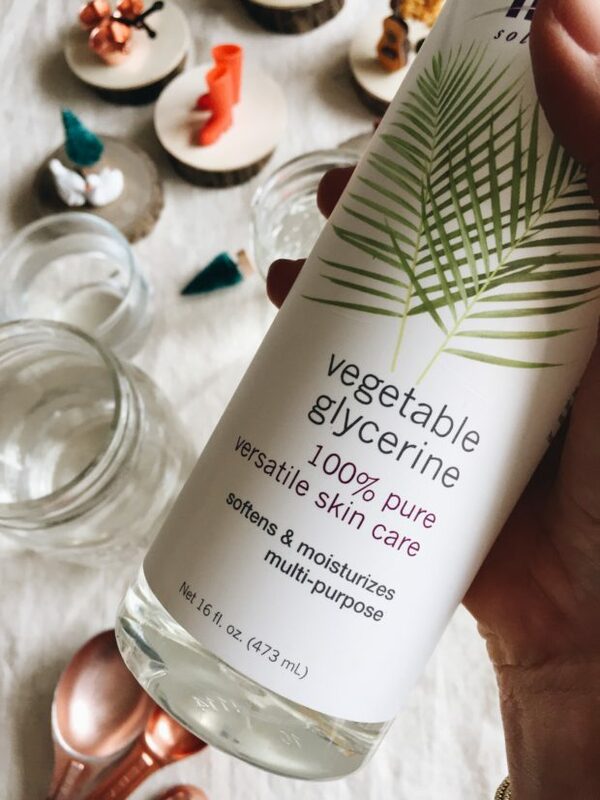 When you do or don’t make these awful things, be sure and add a little bit of glycerine to the water. This will add that thickness that slows down the snow glitter as it falls around its wonderland. 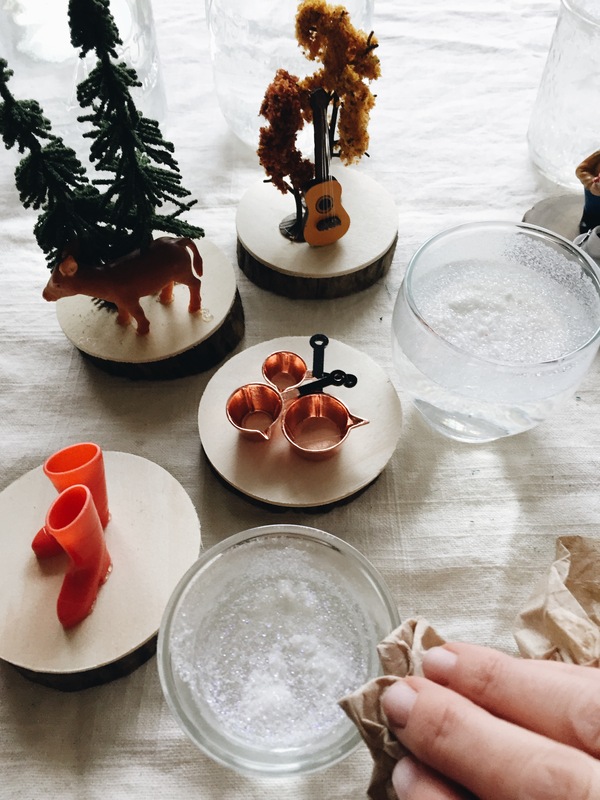 You know, the snow glitter that’s supposed to actually fall and not float to the top of the blasted globes because the store lady said it would work out just fine and you had nothing to worry about. Right, that snow glitter. Then add said demon snow glitter to each jar. And watch it float to the top. What you call the store lady under your breath is up to you. You can also start crying right now, just to get a head start on things. So now it’s time to attach each base to the jars. Oh! How long did you let the hot-glued toys dry to your bases? Five minutes? That should be long enough. They won’t come loose in the water. There’s no way! You used hot glue, when other websites and Aaron said to use silicon glue. You’re fiiiiine. Just wipe down the rims with a paper towel, because you’re about to run your hot glue gun over the rim. Don’t worry, glue won’t drip down into the water and completely dry by the time you make it around the vase. There won’t be strings of violent profanity shooting from your mouth. Naw, you’re good. Once you get the glue on the rim, which took three agonizing tries that shortened your life by three years, quickly place the base on top of each jar. Hold it there. Count to five. Breathe in and out. Dream a little dream for me. See that beautiful autumn tree in that jar? It definitely won’t flake apart and turn into nasty tree sludge and float to the top of the jar within five seconds. Because see, you thought about toys that hold up well in water and don’t break down. You went over that in your head. You’re set! 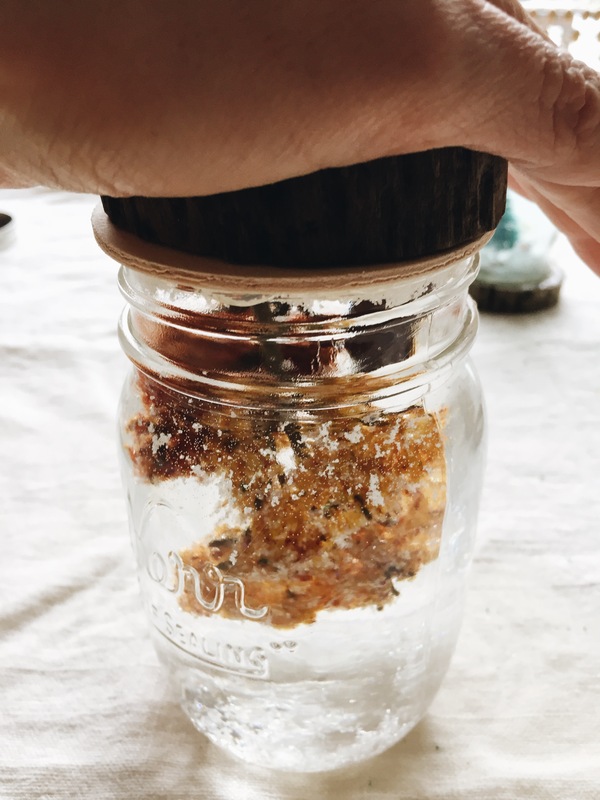 Now, flip the jar over so that all the water you just poured in can leak out like a tiny Roman fountain onto your linen tablecloth and shattered self esteem. Call your husband in so that he can take the hot glue gun (and future blame) and quickly run it around the rim again, to seal up the leaks and holes from your crappy decisions. Remember the head start on crying from earlier? It’s coming in handy right about now. Well, besides the fact that my gnome is face down in a pond of his own tears, the dye from the tiny green trees turned the water blue, there’s air at the top of the red rubber boots (zip it, Aaron! 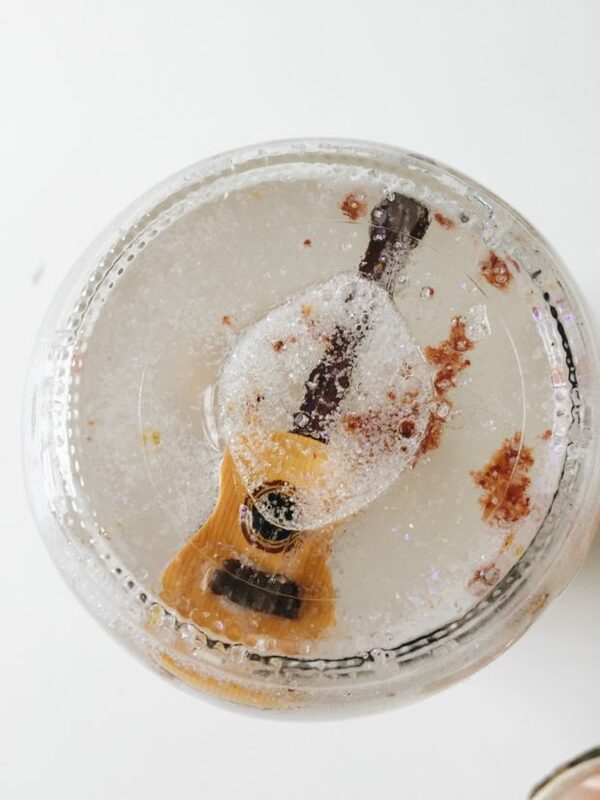 ), the furry autumn trees reacted to the water, turning it into a mix of dirty dishwater and swamp scum, one tiny green tree came came loose and is attempting to impale the gnome, the coffee cup is loose and upside down, the guitar has floated to the top. Most of the snow glitter is sitting at the top of each globe and flipping me off, the nose from the baby deer in the back was glued a li – hold on. Oh wait. Aaron just told me that’s a cow. The cow’s nose in the back jutted out a little too far, causing the jar not to fit over it. Both swans came loose and flew the coop after about 20 seconds. At least the copper pots are in still in tac- nope, there they go. ET TU, copper pots? Maybe use the jar lids as your base? Maybe use silicone glue instead of hot glue? Maybe just don’t make these. ALL IN FAVOR SAY AYE. Or or or! Just glue cute little winterland scenes to some wooden bases and leave it at that. My baby cow/deer with its pine trees is sitting on the mantel, just owning it. Have you made this terrible craft before? What did I do wrong? Was it the glue? Was it the lid? WAS IT MY HAIR? Don’t It Yourself. I’m making shirts. 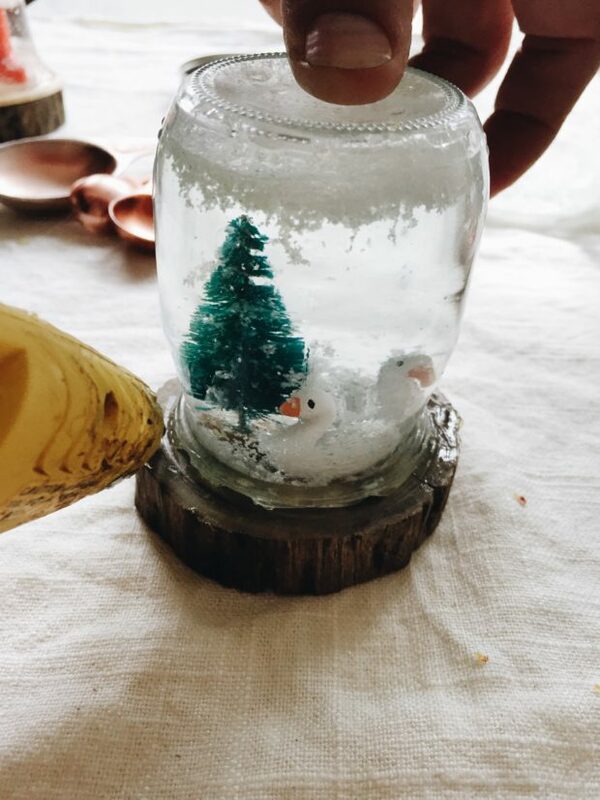 60 Responses to How To Make the Worst DIY Snow Globes Ever. I absolutely loved that you shared a craft gone wrong. Thank you! I wish I had pictures to show you from the time I saw a cocktail glass on a Matchbox car in some fancy museum store catalog and thought, "Oh, how fun would those be for a party. But I don't need to spend $15 dollars. Nosiree. I can make a bunch of them for $15". Erp. Apparently the type of the top of the car, shape of bottom of the glass, width of glass - you know, details - matter. I was out 5 different cocktail glasses and my son was down about 16 car encased in glue before i gave up. This post is my most favorite post ever! So awesome in so many ways! I WOULD SO BUY A SHIRT. Hahahaha....Oh if I had only take pictures of all the DIY failures in my past....the boyfriend cringes every time I say I am going to the craft store. All that matters is that you had fun...you had little fun, right?? I'm dying. BEST/WORST craft ever!! They look like they would be so easy, but they are so difficult! Loved reading this Bev! The little scenes look SO cute before everything went horribly wrong! And this definitely makes me feel better, because 99% of my craft plans never turn out the way I envision them. Also: OMG. Those tiny copper pots. I don't know what I'd need them for, but I need them. PS I think they look great just glued to the wood round!! Precious centerpiece collage or mantle decoration! You're on to something love!! I can not stop laughing!! Genius as always!!! Oh My Gosh! Thank you so much for this post! 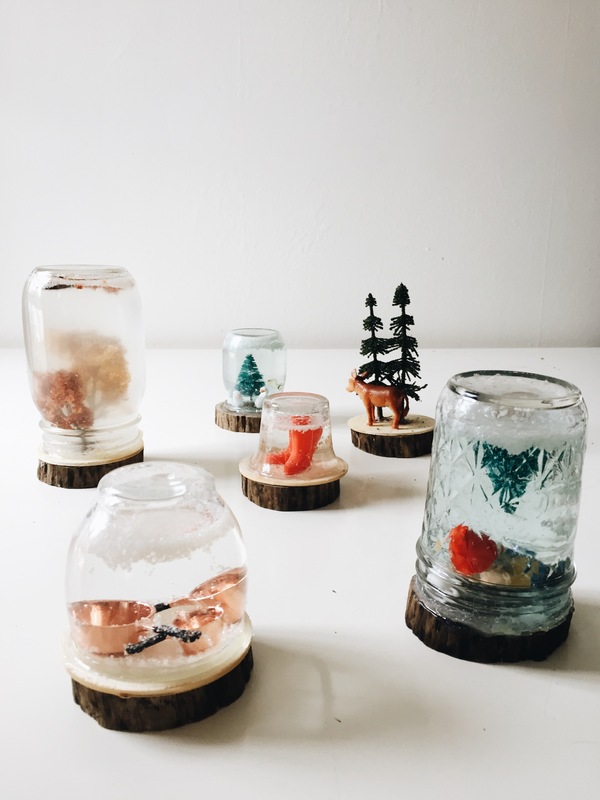 Over the last week I unsuccessfully attempted to make snow globes...twice. Like yours, my water turned greenish blue due to the trees. I used Gorilla Glue that was specifically for crafts using water, so my trees stuck. However, the first go around I was a little too zealous with the glue and it puffed up so much that I couldn't secure the lids on the jars. The second time I was able to close the jars, however, water is still leaking...slowly like the tears down my cheeks. I thought it was just me since I did some research and saw so many successful globes. Thanks for sharing this! All this and a Sound of Music reference? Day = made. This is EXACTLY what I needed after this awful week. Thank you. I will be laughing for weeks. DYING. I just lol'd the whole way through. I'm a stalker-reader who never comments (sorry!!!) love your blog but this is the first time I just had to tell you you kill me in the best way. Thank you? This makes me so happy. I attempt the craft and usually say "it's fine, whatever" at least 5 times. Thanks for keeping it real. This is awesome. Pinning for future reference! I'm glad I'm not the only one who has failed miserably crafting. I had great intentions to have water on the top my college graduation cap (I'm a biological engineer). I had this elaborate plan to have the earth on my cap and I wanted the water to be/look like water (I was using baby oil). After too many failed attempts and half a bottle of baby oil later I gave up and just glue jewels in the shape of the earth and called it a day. Thank you for sharing this crafting mishap! I think this is the best blog post I've ever read. EVER. This made me laugh out loud. Literal LOLs. I tend to do the same thing where I read the directions, ignore what I consider to be "suggestions," and then realize as I'm in the middle of whatever the project is that I probably should have used, say, silicone glue instead of hot glue. Anyway, thanks for such a humorous post! Oh my stars! Five stars for getting my morning off with a good howl....dang funny!! I tried these a few years back (kiddos to give to teachers as gifts). DISASTER from the get go. No leaky, but I did not try your much more creative base idea. Boring ole lids over here. The snow fell to bottom in a nano second - no fun! Thanks for reassuring us it's not all peachy keen in the Bev's DIY world. Love you all the more now (oh...and Aaron!). Oh my!! I so wanted to make an IG story of my tears running down my cheeks, runny nose, cackling laugh, belly-shaking response to this post Bev but I decided to spare you and all my handful of followers. You need your own show. Seriously!! Sorry this was a fail but what a great Christmas craft idea it was! ?So LOVE your real posts and humor!❤️? Best. craft post. ever. This is my crafting life... "Hey that looks cute. Let's try it!... what? wait? why didn't it turn out?! WHY DO THE CRAFTING GODS/GODDESSES HATE ME SOOOOOOO MUCH?!?!?!" When I was getting married I saw a little ombre cupcake in a jar thing as a "invite your bridesmaids to be your bridesmaids!" idea. It had cupcakes sliced nicely into layers of different colors. Nevermind that my sisters were always going to be my bridesmaids and my husband didn't actually propose, we just started planning our wedding, and I was way too old for that ish anyway. I thought instead of the SLICES, which wouldn't fit in the jars as nicely, I'd just crumble different colored cakes and pipe icing in! It ended up looking like crumbled cake with squirts of icing in jars. Not in a good way. I would like two t-shirts please, one for me and one for my husband. My sis-in-law made my hubs a snow globe for Christmas last year -- ended up spending over $100 on a $5 present. The struggle is real!! BEST POST EVER!!! I have tears streaming down my face as I read this! I haven't laughed this hard in WAY TOO LONG! Thanks for sharing! I'm forwarding this post to my favorite crafters now! It'll make their day!!!! ??? Ha,ha,ha! My 11 yo wants to make these......should I let her? Or offer some really nice musical ones from Hallmark? Awesome post - I can identify with the blue water. But I’m insane enough to try again. Pray for me LOL. Cannot begin to tell you how many simple crafts went wrong . Never give up the ship or should I say craft. Trying my hand at snowman tissue boxes. Looked simple! The tears are pouring from my eyes as I laugh my head off. You have such a flair for writing in that truly funny (never stupid) style. You are I Love Lucy for sure. PS all my craft projects (except gluing white pompoms of different sizes in a stack for a snowman) are disasters. I'm dying with laughter. Funniest synopsis of a DIY craft gone bad. Just yesterday I spent way you too much time buying up crafty stuff to "repurpose some old wreaths" to the tune of $50 plus. Now, I'm doubting my intentions after reading your confession of failure. Heck, I can just hang up those darn old wreaths and call 'em shabby chic. My soap box rant is now over...and I feel so liberated!!!!!!! Oh, wait. 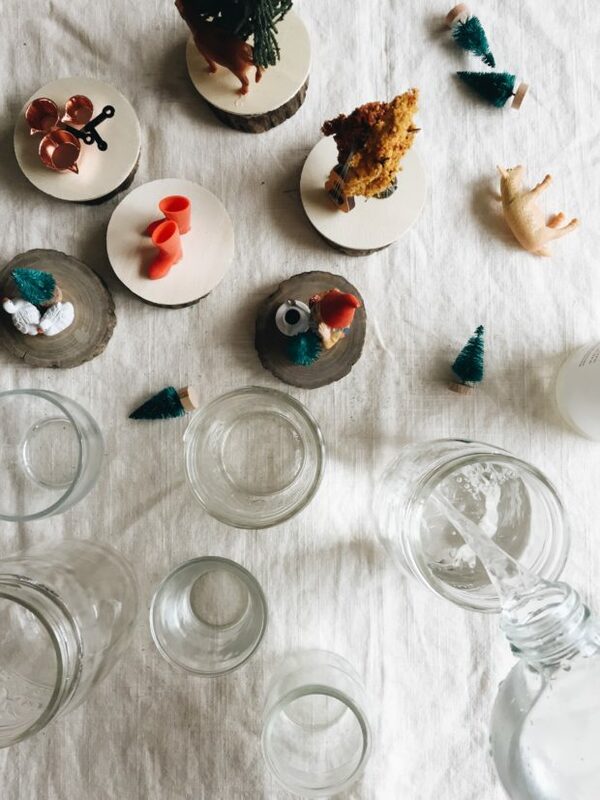 There's another how-to DIY You tube post from that crafty person I subscribe to. What's she up to now??? ;-) Merry Christmas! Helpppp!! How do you seal the frigging jars!! Someone out there must know!!! So this is my very first time visiting your blog and I am DYING of laughter over here! I came across the page while trying to figure out if the whole hot glue thing was going to work for me because the gorilla glue that the guy at the craft store said to buy says it is not for plastic right on the jar (which I clearly did not read at the store). Well I didn't get much hope for the 24 snowglobes and accessories (including said tiny trees that dyed the water and snow that will not sink) I have sitting in front of me in preparation for my daughter's birthday craft this weekend BUT I did get a wonderful belly laugh and a reminder that life is not perfect and sometimes all you need to get through it is a good laugh. Thanks so much for being real and sharing this! So I WAS going to make snow globes with kindergarteners. I ran across your blog after doing extensive research on what to use etc. etc. Thank God for your post! I am now donating those baby food jars to someone else. Saved! Oh my goodness, I was laughing so much I was crying!!!!! My husband and I have spent days and days trying to figure out how to stop the glitter from floating! For some reason I had the since to try out the glitter in water/glycerin before I added it to my snow globe. I too have decided to give up and just leave out the water and glitter. Thanks so much for putting this out on the web. It makes me feel a little less of a failure.